If you’re planning renovations to your home that require you to tear out walls and upgrade electrical components, you no doubt want to make sure that you do the job right. A failure to observe building codes could result in a building inspector citing violations and refusing to approve your project until appropriate fixes are made. This could mean tearing out components you’ve already installed and paying extra to fix the mistakes, which may not be in your budget. Of course, reliable and experienced electrical contractors should be aware of building codes related to electrical components, but just in case, it can’t hurt to know a thing or two. For example, you might not even know what a dedicated circuit is or what its purpose might be, much less whether or not you are required to have them in your home. Trusted electrical contractors in Vancouver can advise you on how to proceed, but here are a few basics you should know for your own peace of mind. As you may or may not know, appliances can draw a lot of power. These days, energy efficient models help you to save on utility bills, but still most large appliances (refrigerators, washers and dryers, and so on) draw enough energy that they need dedicated circuits. What this means is that each major appliance has its own circuit and its own circuit breaker in your electrical box, one that is dedicated to only that appliance and is not shared. The reason why major appliances are placed on dedicated circuits is so that they don’t overload the circuit board when you use them. Even energy-efficient appliances still draw a lot of electricity. If you were to place a fridge and a stove on the same circuit, for example, turning them both on would trip the circuit or blow a fuse because of the energy demand. What about small appliances, though? These appliances need not be placed on a dedicated circuit, but neither can they be added to a dedicated circuit designed for a larger appliance. Fridges, stoves, and other large appliances need their own power sources. The short answer is yes. Not only do building codes require this safety feature, but if you want your home to function properly, you need dedicated circuits. If you live in an older home that’s in need of electrical upgrades, make sure to find reliable electrician services to ensure that you have dedicated circuits installed where you need them. Electricity makes so many of the things we use in our daily lives work, but it is still a major mystery to many. We know that it powers our lights, phones, and televisions, but we don’t necessarily understand how or why. And we don’t understand the specifics or how to manage this electricity. Electrical contractors get us set up with our power, and then we stop thinking about it much after that. This can lead to both minor and more serious problems, like power outages and high electricity bills. While those can both be frustrating issues, it can also lead to more serious problems like electrocution or electrical fires. Most electrical emergencies are caused by a misunderstanding of the basic concepts of electricity. With the following information, you can manage the power in your home without calling in electrician services, and prevent the most common electrical emergencies without the help of electrical contractors in Vancouver. Typically, all of the outlets on one wall are going to be drawing power from the same source. So, if you plug in and turn on too many items into one wall, or one outlet, you are going to overdraw power and blow a fuse. This will lead to a whole room of your house getting cut off from power. If you try to replace the fuse yourself, you may end up doing further damage to the power of the house. Start by properly distributing your power, but if a fuse does get blown, call in a Vancouver electrical contractor to fix it for you. Allowing dust and grime to gather on any electrical appliance could lead to malfunctioning or fire. Make sure any major appliances that are drawing electricity are clean, safe, and not completely out of date. The same goes for the outlets or power strips they are drawing power from. This will keep your appliances operating safely and effectively. An easy way to increase the safety in your home from electrical emergencies while also saving money on your electricity bill is to unplug any appliances that you aren’t using. If you think about it, there are few appliances that really need to be plugged in at all times. There’s no point in the television drawing power if no one is in front of it. Only use power on the appliances you’re currently using. Do you remember growing up and being scolded for plugging in too many appliances into the wall outlets? Perhaps your parents may have been afraid of blowing a fuse? Well I certainly remember those moments and now that I’m older, I can understand my parent’s concern. Did you know that if you overload your electrical outlets, you run a risk of starting an electrical fire? Yeah, that’s kind of a big deal. If you’re moving into an older home, you need to be aware that your electrical system has increased chances of being outdated and you run a higher risk of overloading your electrical system. Fortunately, you found an article that will give you tips to prevent this from happening. Go you!, Read on to learn practical tips you can use today. A good rule of thumb is to only plug in two appliances maximum into an outlet. Now yes, I know this can be hassle and chances are you may even be a friend of outlet strips (I know that I am), but we must remember that the more appliances we have plugged into one outlet, the more stress it adds to that outlet. Be conservative with plugging multiple cords into your outlets. The big appliances, you know, the essentials: refrigerator, oven, air conditioner, washer and dryer, should have their own personal outlet. The reason is that these appliances take up more electricity and are heavily used; therefore, you want to reduce the risk of an electrical overload. Don’t you think it’s a good idea to learn the signs of an electrical overload? Yeah, I do too. Keep your eyes peeled for the following. The lights in your home often flicker or dim, or your lights are behaving in a way that’s showing you that you’re not getting a steady stream of electricity. You blow fuses or your circuit breakers trip frequently. You hear a sizzling sound from your wall outlet. This will be a sound you never heard before coming from your wall outlet. The wall outlet and even the cords are warm on contact and even slightly discolored. If you notice any of these signs; something is wrong with your electrical system! Do yourself a a favor and call a professional electrician immediately to evaluate the situation and prevent further damage. Babies are curious and we love them for their curiosity! Babies often have a way of finding the strangest applications for common household items that often result in a good laugh and a fond memory. Unfortunately, accidents do happen and a baby doesn’t know that’s it’s a TERRIBLE idea to play with electrical outlets in your home! Let’s agree that we should be proactive and read an article that will teach you how to baby proof everything electrical your home. Your baby and your conscience will thank you. Have you ever really looked at an electrical outlet? You know what, they kind of look like a face! For whatever reason, it’s a known fact that babies like to play with electrical outlets! They’re curious, remember? According to the National Fire Protection Association nearly 2,400 kids every year play with an electrical outlet and pay the consequences. Fortunately, there are plenty of solutions for this problem! The most common solution is investing in electrical outlet caps. These are simply plastic caps that you can put into the electrical outlet; which act as a barrier between your baby and high-powered electricity. Electrical outlet caps are cheap, easily available and easy to use. There is one downside though. Electrical caps can be inconvenient! Inconvenient in a really, “I need to remove these every time I vacuum” kind of way. Additionally, it can be easy to forget to put the electrical caps back in the outlet when you’re done using the outlet! If this happens, not only is your baby at risk for playing with the exposed outlet, but they also run the risk of choking on a outlet cap. Alternatively, there are a variety of electrical outlet covers you can buy where you do not have to remove anything. The point is if you want to baby proof your house, you need to make sure every outlet opening is covered up. Babies will grab and pool practically anything which, includes your power cords! More often than not, your power cords are attached to something heavy, which we both know can be a disastrous mix for your baby. I recommend shortening any long power cords and securing all unstable devices. This can be accomplished with DIY solutions such as zip ties and duct tape or more advanced solutions such as purchasing an electrical cord shorteners and brackets. Power strips look like fun toys to babies! There are cords to pull on and open outlets to stick objects in. Protect your baby (and your sanity) by purchasing a child proof strip cover. This keeps your baby space and keeps your power strip running. Do you remember Smokey Bear and how he was against forest fires? You do? Great!! Well, I’m neither a bear nor is my name Smokey, but we do share one similarity; we are both against fires. In my case, I work to prevent electrical fires. If you will, let me take a stab at your present situation: you bought or are thinking about buying an older home and you’re curious to learn about the electrical dangers associated, because, I don’t know, you don’t want your home to burn down. Listen, I don’t blame you, electrical fires are especially scary because you don’t always see smoke when one breaks out and, if you do, then flames may already consuming your home from the inside. In a focused effort to ease your mind, below you can find information on the electrical dangers that are found in older homes. When your house was built, chances are it was built with top of the line materials. Fast forward fifty years and you might just find that the wiring is a little out dated. The problem with old wiring is you can’t see it; so owners are often susceptible to the out of sight out of mind effect. Here’s how you can protect yourself. Replace your circuit breakers with arc-fault circuit interrupters. This simple adjustment will notify you if there is any abnormal sparks or loose connections, both important tip offs that can help protect you from fires. Take a minute to think about that antique oven that your wife loves or the retro refrigerator that you can’t get enough of. Well, I’m here to tell you to think twice about your love for these items. Old electrical appliances, by the simple nature of being old and well-used, have deteriorated in quality every year they. In fact, it isn’t uncommon for the cord of an older appliance to be frayed, thus giving the appliance an opportunity to set your home ablaze! Here’s a simple fix: check the back of your old and clearly cherished appliances to see if the cord is damaged. If it is damaged, do not hesitate to pick up the phone and call a repairman. I used to think that having a loose electrical outlet (when you plug something in and it keeps falling out) was just a subtle annoyance sent from the Gods to make sure that I have a minor annoyance everyday. Boy was I wrong. Those loose outlets can cause the blade of your cord to generate heat, which in turn can lead to a fire. Here’s a simple fix: when you notice loose outlets, get them replaced. I think you’re getting the theme of this article by now; old circuit boards weren’t designed to handle the electricity-hungry demands of the current society that we live in. 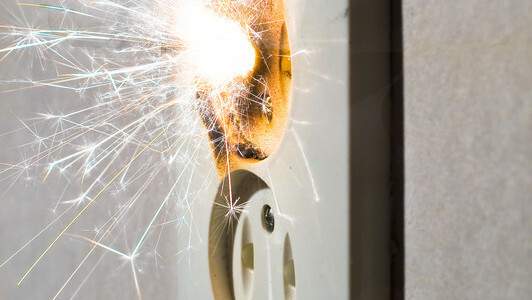 Old electrical boards can overload and cause a spark when it is being maxed out. This, in turn, can cause a fire. Here’s a simple solution: have an electrician inspect your circuit board to determine if it can handle the demands of modern life. There are a number of reasons why you might decide to rewire some or all of your home electrical system. Perhaps your system is hopelessly outdated, out of code, or amateur, posing a safety risk. Maybe it’s not robust enough to handle your modern demand. Or maybe you simply don’t like the positioning of outlets or you want to add more options to plug in electronics and devices. It could be that you’re renovating and you want to strike while the iron is hot. Whatever your reasons for wanting to rewire your electrical system, however, there are several factors you’ll need to consider in the process. First and foremost, you need to behave in a safe and responsible manner when it comes to addressing electrical concerns in your home. Failing to observe proper safety precautions could result in accidents ranging from minor shocks to house fires to death. Safety begins with turning off the electricity before you start working and wearing proper protective gear. You’ll also need to make sure you understand the ins and outs of wiring and electrical codes. It’s a tall order and you may need some professional help. The average homeowner can probably complete simple electrical tasks like replacing lighting fixtures, switches, or outlets. However, more complex tasks like swapping out wiring or junction boxes or updating all of the electrical components in the home are likely beyond the skill and knowledge of most homeowners. It pays to be aware of your limitations and admit when you’re in over your head. Remember, an improperly wired electrical system could not only cause problems when you try to sell your home; it could also pose a danger to the structure and the family within. Before you undertake any home renovation or upgrades you need to sit down and create a realistic budget. In terms of rewiring your home, the cost will depend on several factors, such as the size and scope of the project, materials used, and the price of labor if you hire an electrician or contractor for the job. Get bids and advice from several sources if you’re not quite sure what a reasonable budget should be or if you want to determine a median price range. Professional electricians may go through schooling, training, and/or apprenticeship before they begin offering their services. This should tell you something about the knowledge and skill required to undertake home electrical projects. If you’re not confident in your ability to safely and properly rewire you home electrical system or you want to make sure it’s up to code (and able to pass inspection), don’t hesitate to hire professional help.